These are so easy. Mix up your meatballs then wrap them in bacon. I found cutting the bacon in half (leaving the bacon the same width, just shorter pieces) then wrapping one piece of bacon around each meatball in an x-like pattern worked really easily. The bacon keeps the juices in the meatball, which in turn gives you the most succulent meatball you’ll ever eat! I did use a broiler pan so that some of the fat from the bacon could drain away. When I tried this on a regular cookie sheet it was kind of scary seeing all the fat pooled up at the base of the meatballs. Of course, if you don’t have a broiler pan (a double layer pan with drip holes like pictured here you can still make them. In the recipe instructions I share a way to use a cookie sheet to have the meatballs bake on top all the juices/fats. The other trick in this recipe is to cook the BBQ Bacon Meatball at a lower temperature to allow the meatball to cook all the way through and the bacon juices to slowly drip over/through the meatball. Then raise the temp for a quick burst to crisp up the bacon and allow the BBQ sauce to caramelize! All of this make this BBQ Bacon Meatball a juicy bacon flavored meatball. 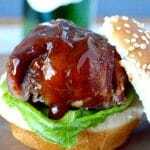 The outside bacon is crispy with the BBQ sauce giving you an added sweet zing. 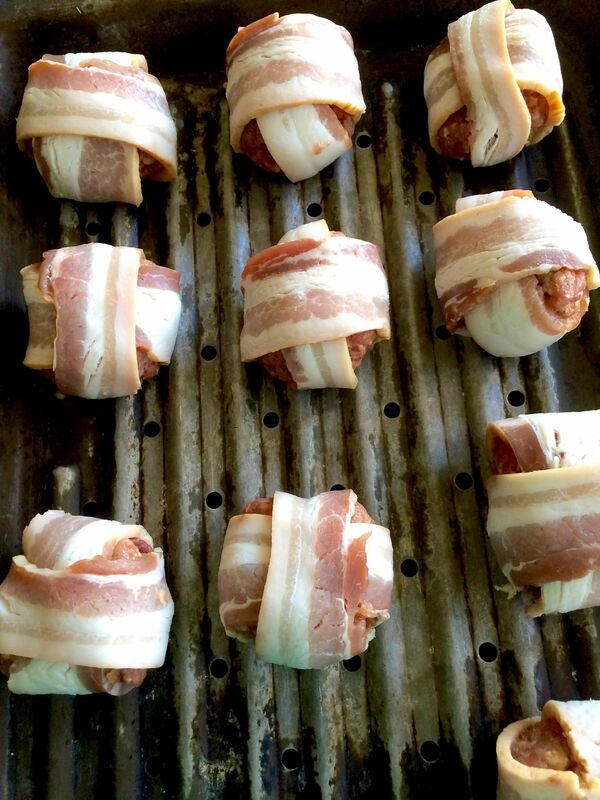 EASY/HARD: Easy, stir up the meatball, wrap in bacon, bake and serve. Really, that’s all there is too it! One note of caution: Don’t over mix the meatball. Yes, I’m completely serious, don’t work too hard when stirring the mixture together and you will have a very tender meatball. MAKE AHEAD? Absolutely. 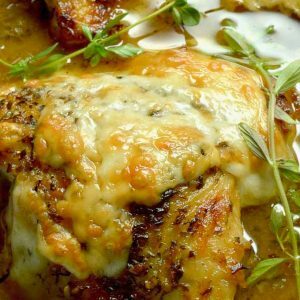 You can make these ahead of time and just warm them up to serve them. I haven’t tried freezing them yet, but I will let you know how that turns out. 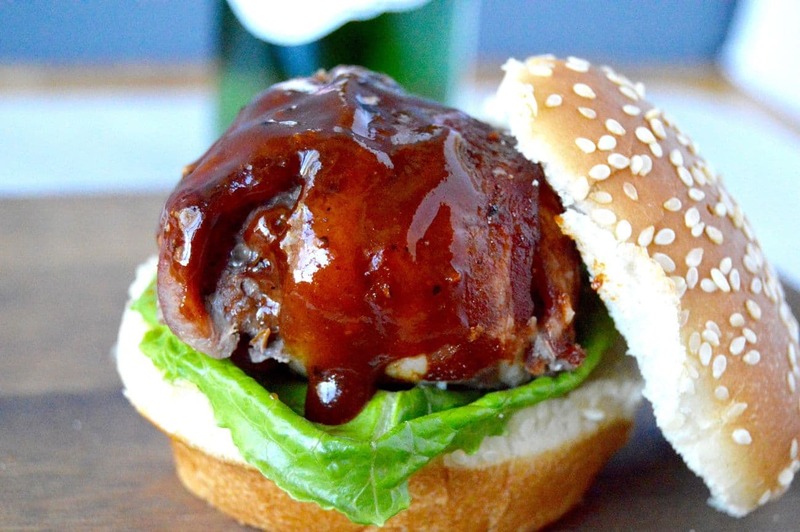 OPTIONS: I served these BBQ Bacon Meatballs in sliders, but they work equally well on their own for bite size appetizers. Serve them with BBQ sauces on the side with toothpicks. They also are perfect stirred in with pasta. 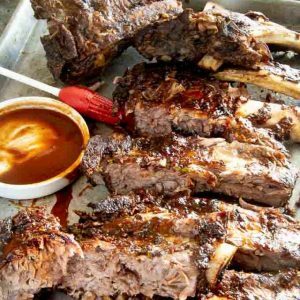 Eliminate the BBQ sauce, and use with your favorite tomato sauce. The bacon is a great addition to regular spaghetti and meatballs! 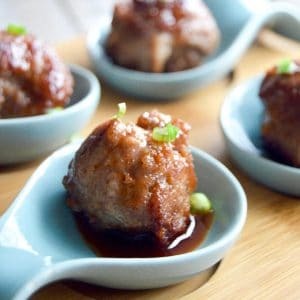 You could use a more tropical sauce (maybe something with a pineapple based) on the meatball in place of the BBQ sauce and serve them as an appetizer with the Mai Tai here! Brush entire surface of bacon wrapped meatball with BBQ sauce. Brush meatballs one last time, and place back in oven for 5-10 minutes. WATCH THEM VERY CAREFULLY! You want the bacon to crisp up but not burn. 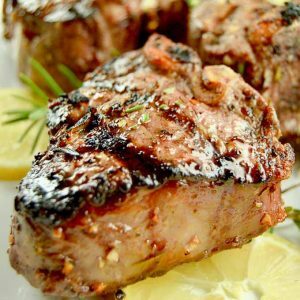 All ovens are very different on Broil. Once bacon is crisped remove from oven and allow to cool for 10 minutes. Place on slider bun and serve along side additional BBQ sauce. These look so juicy and delicious! Yum! These just look absolutely amazing! Love your photos! oooooh goodness these sound amazing!! These meatballs look divine! I’m definitely making them for our Super Bowl Party! Yum! My hubb is the same! He will try anything once but he sticks to his all time faves = MEAT + chicken! Love how beautifully detailed and helpful this post is. All those tips are pure gold! Thanks so much for sharing such a great dish with us. Wow, this looks ah-mazing! I agree with your husband, meatball + bacon, what’s not to love? And then you add BBQ sauce, my favorite condiment. I love all your tips too, so helpful! Wow. I have never thought to wrap a meatball in bacon before, but I think i’ll be doing it soon. All of your cooking tips are fantastic, by the way. Wow these look incredible – the added bacon and juicy meatballs, I’m in love! Gotta try these ASAP! 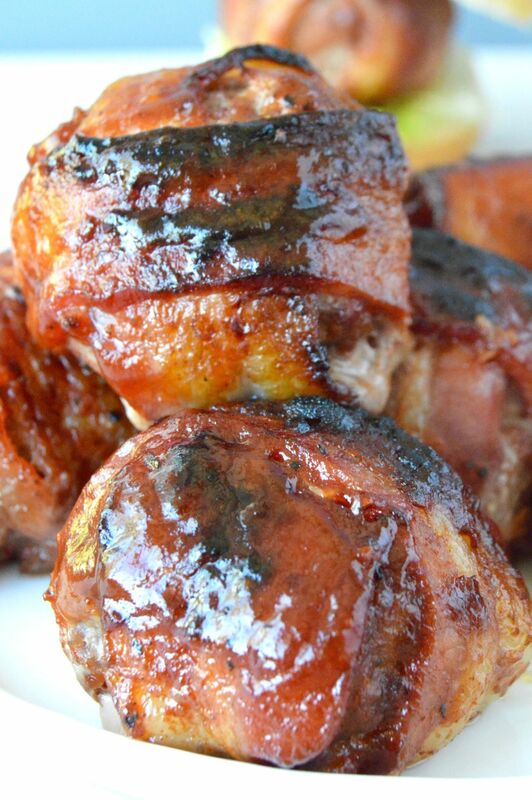 That picture of the bacon wrapped meatballs is to die for! Well the meatballs are to die for 😀 DROOL!!! Michelle, these sliders look amazing! I love that they would be a great appetizer or a meal. Perfect for summer! I bake mine of a broiler pan too. It’s crazy how much fat drips out of these babies! You had me a “juicy meatball,” and then you wrapped it in bacon. Oh my! And THEN, the sauce. Seriously, over-the-top! All of the yesses! These sound incredible and remind me of a similar small snack we had once in Japan. Especially love the mix of bacon and BBQ saucec – to-die-for. Can’t wait to try! 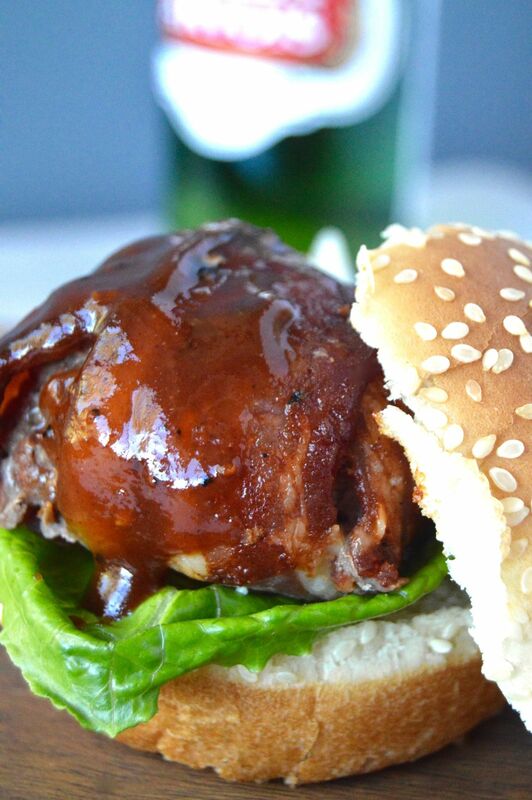 What is not to love about this….it’s meatballs WRAPPED in bacon and smothered in BBQ sauce. Just thinking about it and looking at your pictures is making me hungry! Delicious. Um… Yum! These look awesome! I love meatballs, BBQ and Bacon! Combining them is brilliant! So good! My mouth is watering! Oooooh!! these look amazing. To be fair, you had me at “bacon”. They’ll go down VERY well in my household. Yum!